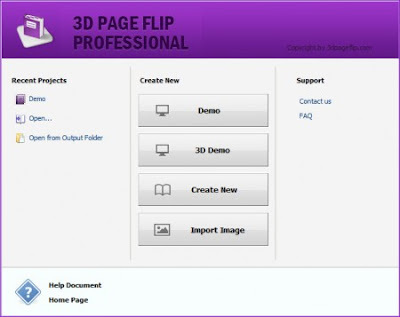 3D PageFlip Professional is a comprehensive tool to convert PDF into realistic page flip magazines in a 3D panoramic background with multimedia objects embedded, including 360 degree rotating products, 3D video, flash, audio, buttons, links etc. It enables you to create and read books in a 3D space. Powerful Flip Book Maker to convert PDF to 3D flipping book! - Convert yourPDF documents to realistic flipping book with a 3D page turning effect. - Powerful page editing functions - create 3D Image Sphere and 360 degree spinning objects; embed Flash, 3D video, Bitmap buttons, Slideshows, versatile text editor, external sites and internal document hyperlinks, audio, MPEG movies. - Customising functions allow you to create your own interface designs for the flipbook (including tool bar with your logo, eBook author information and flip effect). - Publish your 3D flippingbook to HTML, as a ZIP, EXE, and in our 3DP format, as well as versions to ePub, for iPhone, iPad, and Android devices (for online and offline use). - Supplied and downloadable 2D and 3D templates for eBook background: Handy, Float, Fresh, Panoramic, etc.